Posted on February 5, 2019 February 6, 2019 . by Patrick Johnstone. Leave a comment. Another week, another long Council meeting, as we heard from the public about our efforts to address the renoviction issue. Again, there is much to say about the public delegation part of the evening, but I am going to hold that off for a follow-up post, while this one summarizes all of the other important stuff on the Agenda that you may have missed. 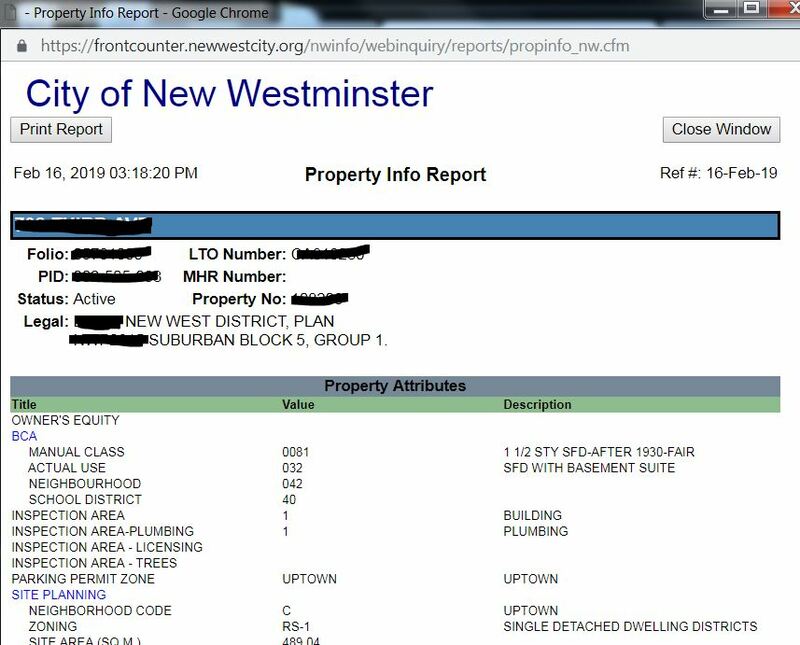 This property owner in Sapperton wishes to create a legal secondary suite, but their house has no back alley access, nor is there room beside their house for a driveway to a back parking lot. So they want to create a front yard parking pad, which is a violation our zoning. That said, Keary Street is one where almost every house already has a front driveway and many have front parking pads – actually, this house already has a parking pad over most of this area, so we are more permitting a non-conforming use that is common on the street. We received three pieces of correspondence (two supporting the application, one against), and no-one came to speak on the Variance. Council moved to approve the variance. This is one of those cases where a DVP is required because a proposed and reasonable subdivision of a lot will result in the frontage being less than 10% of the circumference of the property because of the unusual depth of the lot. This is one of those arbitrary rules that serves as a check on how lot lines are developed in the City, and one for which a variance is usually approved if the lot frontage is reasonable. No-one wrote or appeared to address this variance, and Council moved to approve it. We also move that future parcels created from this property will be exempt from the same rule. This was the agenda item that got the most attention, and we had something like 30 delegations and even more correspondence on it, almost all in favour. I will write more about this in a follow-up post, but for now suffice to say we are taking some creative action to protect tenants from unnecessary renoviction in the City as part of our larger Rental Revitalization program. The City has $163 Million in the bank, which is $6.6 Million more than at the beginning of last year. Our savings are in a combination of commercial bank savings accounts and Municipal Finance Authority investment funds. We are expected to make a little more than the $2.3 Million we budgeted in interest for this fiscal year. I need to point out, this is more than the amount of debt we have issued, and we are making more on our investments than we are paying interest on our debts. It is also important to note that most of this “savings” is not money we can take out and spend at will or use to reduce your tax rates this year. Most of it is restricted to a specific use, such as the $15 Million or so we have saved up to spend on the Canada Games Pool replacement, or the money we have collected from DCCs to invest in sewer upgrades when they are required. I wrote a primer on this here. This is out three-times-a-year report on our major purchases, for those interested in the results of our public procurement processes, be that sole-sourced or tenured. We have named a representative from the Ministry of Transportation in Infrastructure to the ICAC This position exists for a couple of reasons: MOTI owned conduit and right of way through which much optical fibre stretches, and because intelligent transportation systems is a major area of interest for both the MOTI and the City. The City passed a new Official Community Plan in 2017 after more than three years of intensive community conversations. Once the plan was passed, staff moved onto creating policies that will see the vision of the OCP realized – the “implementation phase” in planner-speak. Part of the OCP vision was to see more gentle infill density to increase housing choice in the majority of our City that is still designated for single family detached homes. This includes encouraging small townhouse (strata tenue) and rowhome (freehold tenure) developments around the periphery of the SFD zones, and Laneway and Carriage houses within the SFD zones. At the time, we asked Staff to track the success of this, and report back to us on how the guidelines and policies were going – recognizing the land use economics can shift quickly and best laid plans can age quickly. Short version: we have had 22 formal applications for laneway and carriage houses after more than 100 inquiries. Some are being built today. The townhouse/rowhome side is not moving very quickly, with two applications in process (representing up to 59 homes), though both have local gradient situations that require some adaption from the guidelines. At the same time, staff are proposing some modest changes in the bylaws and guidelines. A couple would follow under the category of “housekeeping”, the rest are subtle changes in how FSR is calculated in one of these developments to meet the massing-control and other goals of the original guidelines while providing more flexibility for the builder and designer to make a livable space. These changes would need to go to a Public Hearing, so watch this space. Installing storm sewer upgrades on Keary Street below east Columbia as part of the RCH project will require some nighttime work during late February and early March, but not on weekends. They need a Noise Bylaw exemption to make this happen. We are getting sloppy. Once again we read the wrong version of a bylaw at first and second reading. So we need to rescind second and third, replace it with the right one, and do it again. We’re busy, stuff happens. Good to know we got it right the second time! This is a follow-up to Bylaw 8084 where we do some housekeeping to assure the language is clear and the new requirements mesh well with existing regulations. Unless you are deeply engrained in the details of “Occupancy Certificates” and “Building Officials”, this may no impact your life. Speed humps were installed by Metro Vancouver on Quayside Drive as a temporary measure in anticipation that the extended Front Street closure would result in heavier traffic and associated unsafe driving on Quayside Drive. Once they were installed, the City received both kudos and criticism from Quayside residents, as is to be expected. Some don’t like the rougher ride, some like the reduced speeds. Despite a few of them being installed in a way that actually made crosswalks less accessible (since fixed), the data indicated that the speed humps had a marginal effect on average and 85th percentile speeds, but did significantly reduce the number of excessive speeders. So in that sense, they work. Given some mixed reaction from the neighbourhood, staff is going to go to the Quayside RA and to residents in general to decide whether the speed humps should stay or go. The City is going to continue the subsidized nematode program to keep a few dozen private lawns tidy and unsustainably monocultural in the City for another year. Insert expressionless face emoji here. We have reached the point where enough people have signed up for a second array for the Solar Garden project. This might be the coolest little community action thing I have ever had the pleasure to approve. It shows that people, when given the tools, want to take personal action to find local solutions to global issues. You can still buy a panel here, but act fast. This is an update on the construction project on the waterfront that has been causing some disruption, both to the physical space and to the peace and quiet of the neighbourhood. I will probably write a follow-up blog on this, but the short version is that we all realized this was going to be a big and disruptive piece of construction, but recognized that the end result was going to be a great addition to our Riverfront. 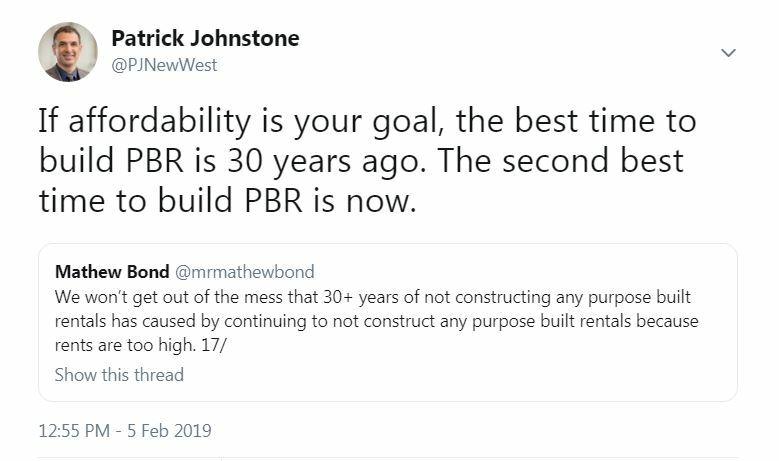 The developer and their construction contractors have had some challenges with the alternative pile driving strategy, and there were two incidents where the contractor on site violated the agreement they had with the City around construction timing, and both times Bosa was fined. They have subsequently worked with city staff to resolve the scheduling conflicts that resulted in the fines, and have taken efforts to reach out to the Downtown business community and residents. Meanwhile they are adapting their construction plans to address challenges as they arise in what is an incredibly challenging project – both in its technical nature and in the jurisdictional challenges. 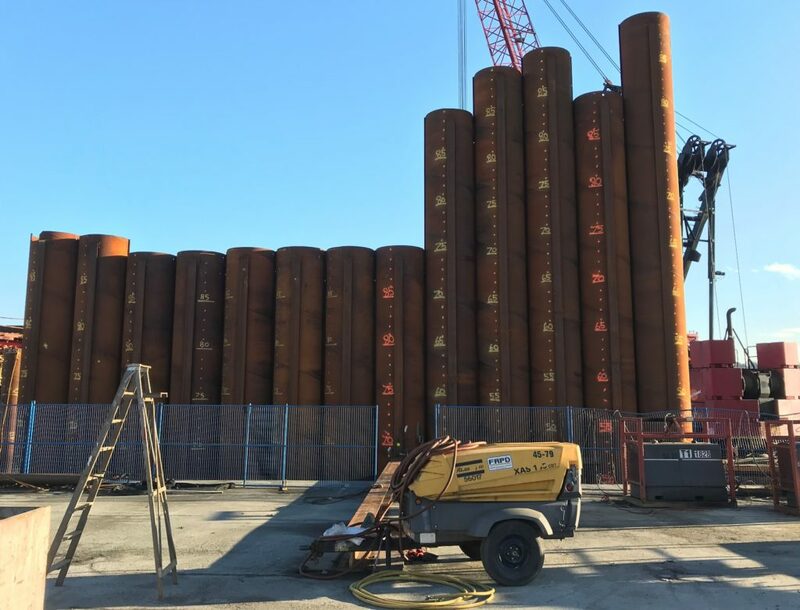 The current secant pile work will be going on until March, and it is possible that the impact drivers will be operating one or two days a week during regular construction hours during this time. Bosa are working with the City to maintain accessibility to the River Market and the Pier Park, and have set up a project website to communicate with the community, and are even holding a community meeting next week (follow that last link for details) to let the neighbourhood know what is going on. Once again the local taxi companies are applying to the City and the Passenger Transportation Board of the province to add vehicles to their fleets so you won’t have to wait a half hour for one to show up. Royal City Taxi was permitted 9 new vehicles, none of which is required to be an accessible vehicle. Queen City Taxi was permitted 2 new vehicles (they applied for three). Neither of which is required to be an accessible taxi. The justification of the Passenger Transportation Board for the lack of new accessible taxis was, essentially, that 17% of the local fleet is accessible, and both of these operators have 17% or more of their fleet accessible, which is perfect circular reasoning. Unfortunately, it did not address the concern raised by this Council last year (brought to our attention by the Access Ability Advisory Committee) that the local accessible fleet is inadequate. Council even wrote them a letter to the effect, asking them to increase the accessible fleet next time they g o through this exercise. Clearly they were no compelled by our letter, so we are going to send them another one, asking them why not. Because that would be the polite thing to do. The issue of Short Term Rentals (AirBnB, VRBO, and the such) has been bubbling along below the surface for a couple of years. I even hosted a Metro Conversation in New Westminster on the topic two years ago, where we talked frankly about the opportunities, and potential problems, related to this “disruptive” industry and the regulation of it. Vancouver recently passed a set of regulations for STRs in their community, and a few other communities from Nelson to Victoria have taken somewhat different approaches to the regulation. The City of New West has decided to take the Vancouver model, and use that as a framework to be adapted through a public consultation process in order to make a modified set of regulations to fit our situation. This will be going out to the STR operator community and the public, so watch this space! Council is taking a motion to the UBCM asking the federal government to invest in a restorative justice and community based court system for indigenous peoples, as part of a larger effort to address the systemic flaws in our existing justice system that sees indigenous people incarcerated at an unbelievably higher rate than the rest of the Canadian Population. These Bylaws that clear up our ticketing bylaws and update our fines for a variety of offences, including some of the ones that make our pedestrian spaces less safe, as discussed at the January 28 meeting, were adopted by Council. Posted on January 30, 2019 . by Patrick Johnstone. 1 Comment. We need to build a new electrical substation in Queensborough. The electrical utility needs to borrow up to $30Million to do that. Since it will take more than 5 years to pay that loan back (as it will be paid back out of the profit we make in electrical sales), we need authorization from the public to draw that loan. I hate the Alternative Approval Method, but it is the only tool given to us under the Community Charter to get this important infrastructure built, so here we are. 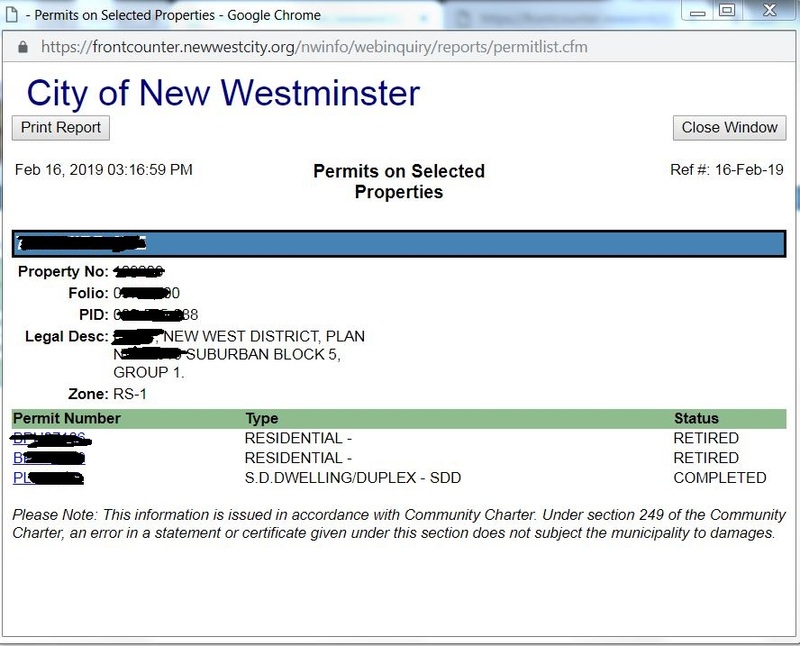 If you are opposed to the City’s electrical utility borrowing to build a substation, and are an eligible voter (New West resident or property owner, Canadian Citizen, over 18, etc.) you will have a 30+ day period to submit your opposition to the City. Come to the front desk at City Hall and fill out the form before March 11 at 7:00pm. This is the official release of the residents and stakeholders selected to serve on council Advisory Committees and other boards and panels in the City. If you applied for any of the above, look for your name here! If you don’t find your name, please don’t take it personally, we literally have hundreds of applications, and most of them were really good. It is hard to say “no thanks” to someone who is willing to stand up and take part in their community this way, but committees of 30 don’t work. Please apply again next year, as we are always trying to balance out experienced committee members with new brains to keep things fresh. If you were named to ACTBiPed, Access Ability, the Electrical Commission, the Intelligent City Advisory Committee, I’ll see you at City Hall! This is some last-minute shuffles of Council Advisory Committee chairs and co-chairs, as the new Council figures out their schedules and attempts to find some kind of balance. One of the appointments to the youth Advisory committee has to change, on account of the Terms of Reference. Coming off of our approval of community grants, there were two items that were removed from the regular approval process to get more information about the applications and applicants. We moved the staff recommendations to provide some funds to a tumbling club, and to move New West TV to a different category and find a more appropriate way to support them. We spend a lot of money on Festivals in this City. But that said, the #1 positive thing people say about New West these days is that they love that so much is happening in this City. Every one of these Festival Grants is supporting a program or event that is primarily NOT run by the City, but by other organizations in the city, large and small. The City provides engineering and support services (though we need to account for them here as “in kind donations”), and we give a little bit of cash, concentrating the latter on supporting new up-and-coming events over more established events which we encourage to adopt more of an self-supporting model over time. Alas, New Westminster is a small City, and all of these organizers and events compete for limited sponsorship dollars. Support festivals! Show up, spend money in their booths, send out social media messages about the event. And if you own a business, think about sponsoring the events that make New Westminster the funnest City in the lower mainland. The Terms of Reference of the EDAC is being adjusted to make the committee work better in the context of the new Economic Development Plan for the City. Included in this report is a bit of information about the two types of power our Bylaw Officers have: the Bylaw Offence Notice (BON) process which is limited to a $500 fine and is basically an in-house operation that is adjudicated at City Hall, and a Municipal Ticketing Information (MTI) process, which is adjudicated by the courts, but can include a fine up to $1000. The City almost exclusively uses the BON model since it was introduced to the City in 2009. Every time we make and adjustment to a Bylaw that changes the type of offences or fines, we also need to amend the Bylaw that regulates these fines so the two are congruent. These amendments pile up to make the Bylaws unwieldy at times, and internal inconsistencies sneak in. So staff does these housekeeping edits to fix some of those inconsistencies. While we are at it, we are boosting the fines for refusing to allow inspection of property (the cost of the City going to a Justice of the Peace to get an Entry Warrant is going up), and are adding Transit Police to our Bylaws to give them more flexibility to enforce City Bylaws around transit stations (i.e. smoking). [Trigger warning – War on Cars rhetoric coming!] According to the BC Injury Research and Prevention Unit, and corroborated by research out of the City of Vancouver, the #1 cause of pedestrian injury and death is vehicles failing to yield in a crosswalk where the pedestrian had the right of way. Pedestrian collisions result in more than 2,000 injuries and 50 deaths on average every year in BC – all of those preventable and the majority to no fault of the pedestrian. I think a $125 fine for this violation is not high enough, compared to a $200 fine for blocking traffic or for fixing your car while it is parked in front of your house. I also feel the fines for other significant pedestrian hazards, such as parking too close to a crosswalk or an intersection, are too low. As an aside, I also suggest the word “jaywalking” needs to be removed from our Bylaws. The term itself is pejorative towards vulnerable road users, and has racist and classist roots that do not fit well with modern thinking about the residents of our city. I appreciate the changes being made, and supported the recommended changes. But I wanted Council and staff to recognize that one of my goals for this council term is to prioritize pedestrian safety through education and enforcement so we can meet the goals of the MTP. This will include review of enforcement activities and fines related directly to creating safer pedestrian spaces. [Off my soap box]. We want to do it all. New Westminster, despite our visions and dreams, is still a relatively small municipality, and we need to allocate and prioritize resources based on our relatively small tax base. This includes prioritizing the workload of our planning staff. It is a busy time in the city, the OCP implementation is coming along at the same time as we are pushing the envelope on rental protection and affordable housing and development is happening at a pace that requires careful review. This report is about our Planning staff setting priorities for their work plans for the next couple of years, and giving Council a change to weigh in on whether the priorities are aligned with Council’s expectations. We ended up sending back this report with a few recommendations about what our priorities are, specifically some of the policy work around creating infill density guidelines for duplexes and triplexes was identified as something some on council don’t want to delay on. I was a little challenged, because setting priorities is hard, for staff and for Council, and we cannot afford to do it all. We are going through some strategic planning work on Council right now, setting goals for the term, so perhaps that process will help inform this a bit before it comes back to Council. But the question will ultimately be – do we do a little less, or do we add more resources? Our engineering staff do these neighbourhood-level traffic reviews on a regular rotating basis, and Queens Park (the neighbourhood, not Queen’s Park the Park) came up in 2017-2018. After public consultation, on-site analysis and data-gathering, more public meetings, and engineering analysis by an external consultant, some modest proposals are presented to help address what are, in the grand scheme of things, pretty modest traffic management issues. Not surprisingly , the 85th percentile speed on some of the wider roads exceeds the posted speed limits. I did raise some questions about whether road narrowing was considered in a few places where road widths are really wide (i.e. Second Street at Queens Ave is 18m wide – crazy wide for what is ostensibly a two-lane road), and though it may cost more than simply installing a 4-way stop, it may improve the pedestrian experience while adding to the “friction” of the road that results in lower travelling speeds. There is also an interesting trial proposed here – closing the bottom of Park Row to deal with high speeds on that road, and a difficult intersection and pedestrian space where Second Road, Park Row and Royal Ave all meet. I generally like the idea, but recognize that the impact on local residents and on Bonson Road (which is really just an alley) will take some monitoring. This Bylaw that updates the fees we charge for various engineering fees was Adopted by Council. Consider yourself CPI updated. Council agreed with Councillor Das’ motion asking staff to report back on the feasibility of establishing New Westminster as a Sanctuary city. This seems an easy and appropriate step towards making our City more inclusive. That was the end of a long night, and I will follow up with a post about the Public Hearing. Posted on January 17, 2019 January 18, 2019 . by Patrick Johnstone. Leave a comment. Posted on December 27, 2018 . by Patrick Johnstone. 4 Comments. I’m on vacation, I’ll be back next week. However, this letter to the editor of the Burnaby Now entered my social media feed, and much to MsNWimby’s lament, I had to take a few minutes to pen a retort. I thought of sending it to the Burnaby Now, but I thought it would look weird for a New West City Councillor to get something like this published in a Burnaby newspaper, so instead I’ll just post it here. Letter: Why can’t bullied kids just get with the program? Editor: Last weeks’s Burnaby NOW had a letter from Diane Gillis raising important questions about why pedestrians don’t work harder to protect themselves from getting hit by cars. I think it provides a great platform to offer similar safety tips for youth suffering from another well-identified danger in today’s society: schoolyard bullying. It does not matter who is right and who is wrong in schoolyard bullying – it is the bullied child who is at greatest risk of injury or psychological trauma. Sadly, there are too many children who do not understand or know of what they can do to avoid bullying. I chair the communications subcommittee of my local Concerned Parents of Athletic and Cool Children chapter, and we coordinate anti-bullying messaging for our children, and those who do not qualify. At the November CPACC meeting, we discussed ways to reduce bullying. All children should consider these anti-bullying safety tips. Wear more attractive / fashionable clothing so the cool kids will not notice your lack of flair. If wearing professional-sports-team-branded clothing, be especially aware of the sports franchises preferred by the local cool kids. Don’t go to places where bullies hang out, like malls, schools, or outside. If you have to go to those places, look out for bullies. If you see a bully, run away really fast. Don’t make eye contact with bullies. Don’t use your phone and/or headphones, or carry anything of value while walking where bullies might spot you. If a bully approaches you, hand them your lunch money and beg for mercy. Something I think is telling. Yesterday afternoon at about 3:30 p.m. – just after school gets out and when most kids were playing sports or hitting the Mall – as I was driving past a schoolyard in Burnaby, I saw a skinny, nerdy kid getting taunted by a group of pretty cool-looking kids. When I saw his Minnesota Wild t-shirt, his last-year’s Walmart Nikes, wire-rim glasses and his clarinet case, it was all I could do to stop from yelling “Hey Nerd!” and slapping the little loser myself. There is a lot more to the concerns of many of us regarding keeping all kids safe from bullying. And as long as we can continue to blame the victim, none of us will ever have to recognize our own personal responsibility to keep our community safe for all, or even acknowledge what the real dangers are.